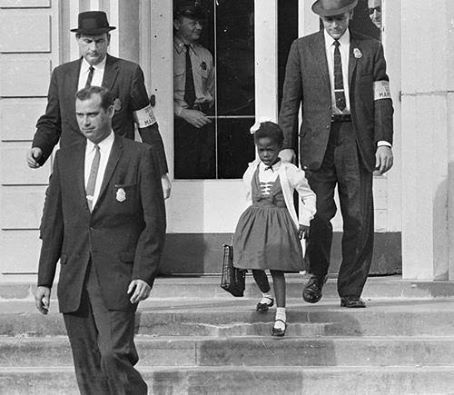 November 14th 1960 and Ruby Bridges, a very brave African American 6 year old girl enters a previously all white school flagged on either side by US Marshals who were required each day just to keep her safe. That year the US government had started the National Association for the Advancement of Coloured People and her parents had volunteered her to them to join an integration plan for New Orleans schools. Her father wasn’t keen on the move but her mother thought it was vital that someone took a stand in order to improve the education of all African American children and that someone would be Ruby. November 14th 1960 was the day the courts decided the schools had to become integrated and it was the day Ruby would face the wrath of the previously all white school. As she arrived on her first day crowds gathered to throw physical objects and vile abuse at her but Ruby just marched straight through the crowds, not crying and not showing any signs of fear. On that day bravery had a new face and it was a 6 year old girl. Seeing a black girl walk through the schools gates the backlash started, other parents started pulling their children out and all the teachers decided they couldn’t in all moral consciousness teach there whilst a black child was at the school. One teacher however decided that the 6 year old girl shouldn’t stand alone. Barbara Henry refused to walk out and alongside Ruby, every single day she braved the abusive crowd and risk of threats to herself and her family in order that she could teach the little girl. The protests became more and more sinister as time went on but nothing could change Ruby and Barbara’s resolve. One woman threatened to poison them every day and another parent stood at the steps each morning with a coffin with a black doll in it. US Marshalls had to be sent in order to ensure their safety yet still they carried on refusing to be beaten by the vitriol. It wasn’t just Ruby that suffered, her father was fired from his job immediately, the whole family was banned from local grocery stores and her grandparents were thrown out of their home. Ruby Bridges is still a resident of New Orleans and runs the Ruby Bridges Foundation which fights racism to this day. Well represented. Such a brave little girl. Beautiful, what a brave girl we should all learn from. You gotta wonder about the world we live in sometimes. People can be so cruel. Been waiting for your next post and this one made me cry. Only 50 years ago, unbelievable. More please.